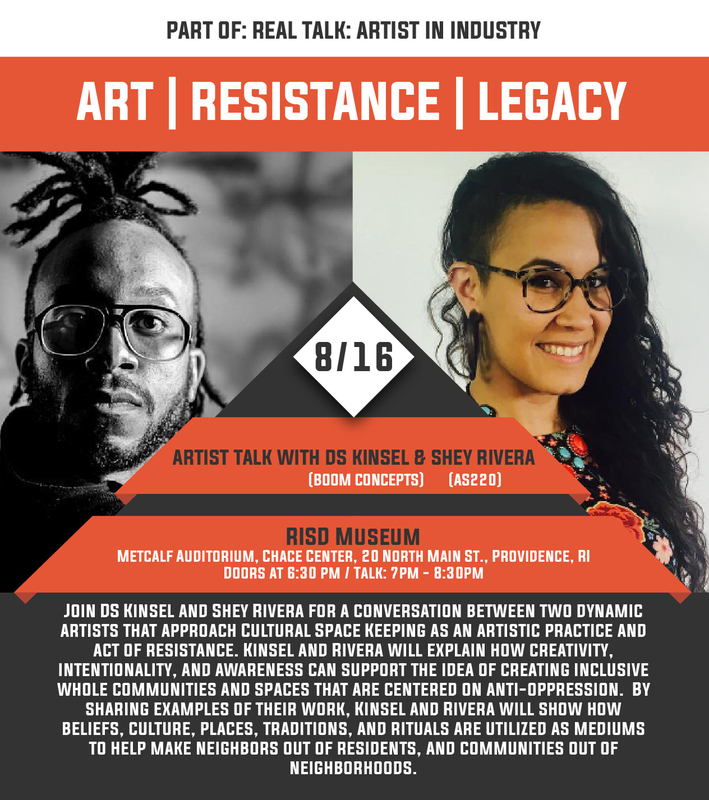 Join DS Kinsel and Shey Rivera for a conversation between two dynamic artists that approach Cultural Space Keeping as an artistic practice and act of resistance. Kinsel and Rivera will explain how creativity, intentionality, and awareness can support the idea of creating inclusive whole communities and spaces that are centered on anti-oppression. By sharing examples of their work, Kinsel and Rivera will show how beliefs, culture, places, traditions, and rituals are utilized as mediums to help make neighbors out of residents, and communities out of neighborhoods. Shey Rivera Ríos is the Artistic Director of AS220, an internationally renowned arts center in Providence, RI, and a multi-genre artist. Rivera’s work at AS220 focuses on the role of art and culture as a catalyst for social change through community engagement, cross-sector partnerships, and creative placemaking. Rivera was part of the founding team of Festival de la Palabra (2010), the largest literature festival in Puerto Rico. The same team reopened the Museum House Concha Melendez in San Juan and activated it with public programming as a hub for literary arts. She is an active member of the National Association of Latino Arts and Culture (NALAC) and the Alliance of Artist Communities, and completed performance/multimedia arts residencies at BOOM Concepts Gallery in Pittsburgh, as well as Santiago, Chile, where she performed at the Museo de Arte Contemporáneo de Santiago. Most recently, she completed a body of work titled FANTASY ISLAND, an immersive multimedia installation and performance reflecting upon the debt crisis in Puerto Rico. Rivera completed a BA with double major in Psychology and Sociology in the University of Puerto Rico and coursed the graduate program for Contemporary Media and Culture in the University of the Sacred Heart, San Juan, Puerto Rico. Rivera is a strong advocate of artists and creative practice as catalysts for social change.